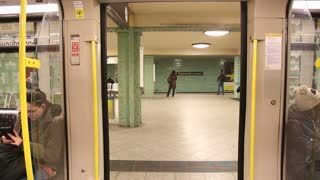 BERLIN, GERMANY - 28 JANUARY 2015: Automatic closing doors on the underground train, U-Bahn in Berlin. 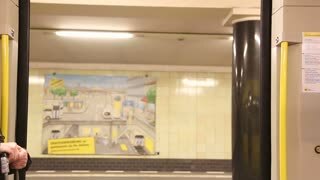 BERLIN, GERMANY - 28 JANUARY 2015: View of automatic closing doors, shot from inside of underground railway train on the U-bahn in Berlin. 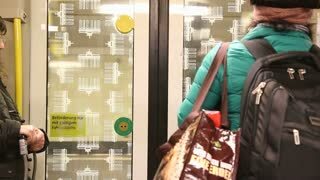 BERLIN, GERMANY - 28 JANUARY 2015: U-bahn automatic closing doors with passengers in wagon in Berlin.